Made from 100% recyclable plastic this chair is available in all of our poly colors. 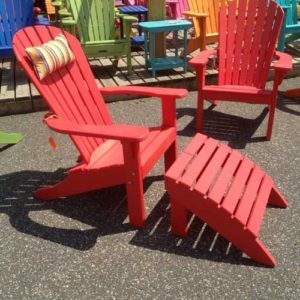 This is where it all started on our Adirondack chair collection. We are making this chair foldable so you can take your favorite chair everywhere. We added a new twist to this chair, we made the front legs 2 inches taller so its easy in and easy out which is important because you will want to sit in this chair for hours. Made from 100% recyclable plastic this chair is available in all of our poly colors. 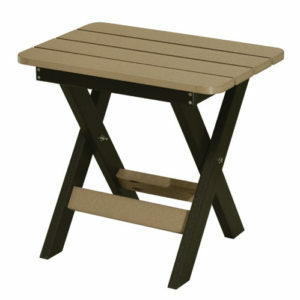 This is where it all started on our Adirondack chair collection. We are making this chair foldable so you can take your favorite chair everywhere. We added a new twist to this chair, we made the front legs 2 inches taller so its easy in and easy out which is important because you will want to sit in this chair for hours. The accessories you can add to this chair are head pillows, seat cushions, cup holders, matching end tables or our new and exciting gas fire pit collection.